Master the forces of magnetism in this Games 100 title! In this unique and one-of-a-kind game, players take turns making magnetic discs defy the laws of gravity and stay still in mid air! By strategically placing your discs on the mat, you begin to trap your opponent so you have the advantage to gain points. As a result, chaos ensues which causes discs to collide and a magnetic frenzy could erupt which can result in scoring opportunities. Towers of discs are scored as points; the player with the most points at the end of a game wins. Watch out for the always dangerous red disc, any movement of that piece and the game is over! 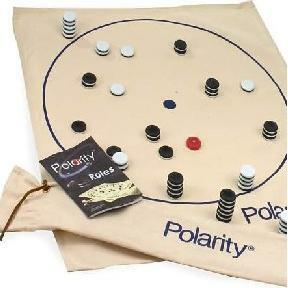 Polarity is simple to learn, but provides a deep and exciting challenge for advanced players. You will never get bored of Polariety because it encourages the testing of new tactics each time you play and is never the same game twice. This game will tests players patience, agility, and strategic ability. Do you have what it takes to master these skills?